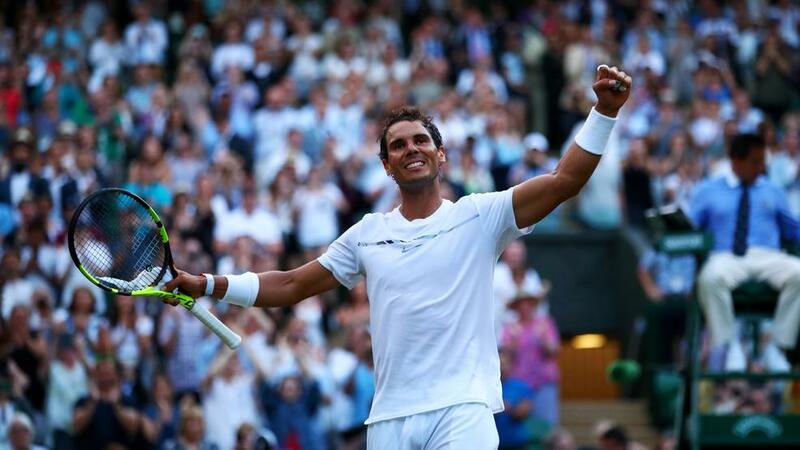 WIMBLEDON— If someone had told Rafael Nadal as he approached the world's most prestigious tournament this year that he would get through the first week without the loss of a set, the Spaniard would have flashed his universally recognizable smile and said something like, "Sign me up for that scenario. Count me in." Now the 31-year-old has done just that after a 6-1, 6-4, 7-6 (3) triumph over the immensely promising Russian Karen Khachanov. The Spaniard will not compete again until Monday, and that two day break will be ideal for a man who pours so much emotional energy into every match. Having the weekend off is just what the doctor would have ordered for this singularly intense and purposeful man. The last time he reached the round of 16 here was three years ago. He was ushered out of the tournament by a highly charged and almost madly inspired Nick Kyrgios, who served 37 aces across a four set triumph. Nadal will meet Gilles Muller this time in the fourth round, and the 34-year-old from Luxembourg will well remember his victory over Nadal back in 2005 in the second round. Nadal, too, will easily recollect that defeat, and will vow in his mind to not let it happen again. But let's first examine Nadal's win over Khachanov, which proved to be a serious test in the end after the No. 4 seed came out of the blocks in style, devouring his 21-year-old adversary who is ranked No. 34 in the world and was seeded No. 30 at this tournament. Undoubtedly, Khachanov was a very nervous individual at the outset of the contest on the fabled Centre Court stage where so many players have been made to feel uncomfortable and overwhelmed by their surroundings. And so it was for the Russian. The fact remains that Nadal was blazing off both flanks in the early stages, flattening out his forehand for screaming winners, driving through his backhand cleanly with full resolve, serving with sustained velocity and accuracy. Khachanov never quite knew what hit him during the early part of the match. Was it the Centre Court? Could it have been the imposing, omnipresent Nadal? It was probably a combination of the two. But the fact of the matter was that Nadal left Khachanov dumbfounded as the first set unfolded. The Spaniard was flying high and leaving nothing to chance, and Khachanov was perplexed and unnerved. Nadal held at love for 1-0, serving two aces, including one on his second delivery. He then went to 0-30 on Khachanov's serve in the second game with a forehand drop shot winner and a lethal forehand winner up the line. Khachanov took the next point but Nadal drew a couple of mistakes from his opponent with skillful use of the sliced backhand. It was 2-0 for Nadal. Down 15-30 in the third game, he collected three points in a row—all on errors off the forehand from the Russian. A beleaguered Khachanov trailed 0-3, and soon faced more danger. In the fourth game, Nadal reached 15-30, turning around a point he seemed certain to lose, shifting from defense to offense brilliantly, firing a winning forehand crosscourt. Shaken, Khachanov double faulted. At 15-40, his 133 MPH first serve was returned magnificently by Nadal, who took that point with a searing forehand winner down the line. The Spaniard had moved swiftly into a 4-0 lead, sweeping 16 of 20 points in the process. Although he lost his serve at love in the following game, that hardly mattered. Nadal was reading Khachanov's serve so consistently there was no way the Russian could stay safe on his delivery. Nadal broke Khachanov at 30 for 5-1 and then, boosted by another ace, he held at love to seal the set 6-1. It lasted only 22 minutes. Nadal was setting the pace, ruling the rallies, and garnering clusters of free points on serve. He was masterful while Khachanov was a befuddled figure looking for a way to make his presence known and establish a better rhythm. To his credit, he went to work diligently in the second set. Nadal had three break points in the opening game, but the Russian survived and held on for 1-0 with a 126 MPH first serve down the T that provoked an errant return from the Spaniard. Nadal remained largely invulnerable on his own serve, holding at 15 for 1-1 with three unstoppable first deliveries. Khachanov fought off three break points in the third game but Nadal converted on the fourth, making another fine return off a 130 MPH first serve and taking that point on a miss-hit forehand long from the Russian. Nadal promptly held at love for 3-1 but Khachanov followed with a gem of a service game, holding at love with four aces, going down the T on all of them. Nadal surged to 4-2 with a hold at 30 but the markedly improved Khachanov held at 15 with a backhand down the line winner in the seventh game. Nadal was now feeling the heat of his opponent's game. He moved to 40-15 in the eighth game but dropped the next two points. Undismayed, he sent out a heavy forehand that Khachanov could not handle off the backhand, and then the Spaniard camped out under a high lob from his adversary, took his overhead on the bounce, and pounded it inside out for a winner. That made it 5-3 for Nadal. He had a set point in the next game but a resolute Khachanov held on, forcing Nadal to serve the set out in the tenth game. Nadal was thoroughly up to that task. He held at love with a service winner to the backhand, an ace at 119 MPH down the T, a forehand winner down the line and a delayed serve-and-volley package that led to a forehand passing shot error from the 21-year-old. That love hold without a missed first serve gave Nadal the set 6-4. He was up two sets to love. After a long bathroom break, Nadal returned, and squandered some chances that would have made his path to victory more straightforward. He had a break point at 1-1 in the third set but lost a freakish point when Khachanov left the court wide open by not putting away a ball from short range. Nadal steered a forehand down the line into an open court and seemed certain to win the point but Khachanov retreated beautifully and lifted a lob down the line for a winner over the head of a charging Nadal. Khachanov held on for 2-1 but Nadal surged to 2-2 with a love hold. He had a break point in the fifth game that Khachanov erased with a well executed forehand volley winner. On to 3-2 went the determined Russian. Nadal was clearly yet quietly disconcerted. He had a 40-15 lead in the sixth game but had to eventually hold on from deuce to reach 3-3. Khachanov advanced to 4-3 at the cost of only one point and now the pressure was mounting on Nadal because of his missed opportunities. He opened the eighth game with an unforced error on an inside out forehand. He then trailed 30-40 when his second serve turned into an accidental ace after a bad bounce caused Khachanov to swing and miss. Khachanov garnered a second break point but Nadal's 121 MPH first serve down the T was too good. The Russian created a third break point opportunity for 5-3 but a heavy slice serve wide at 101 MPH set Nadal up for a forehand winner behind Khachanov. Gamely, obstinately, courageously, Nadal held on for 4-4. Both players were competing ferociously now. Khachanov held at 15 with an ace out wide for 5-4 before Nadal held at love for 5-5 on a 103 MPH second serve ace out wide in the ad court. On his way to 6-5, Khachanov released three aces, holding at 15, causing more consternation for Nadal. At 30-30 in the twelfth game, Nadal missed a forehand down the line under little pressure. Now down set point, he responded commendably with a first serve down the T at 122 MPH setting up a forehand drop shot winner. He moved to game point but double faulted, earned a second game point but erred off the backhand, but then came forward confidently to angle a short forehand volley crosscourt for a winner. On his third game point, Nadal came through to reach 6-6. At 1-1 in the ensuing tie-break, Nadal sent a forehand drop shot low over the net for a daring winner. Khachanov got back to 2-2, but he would take only one more point. An unforced error off the forehand from the Russian gave Nadal the mini-break for 3-2, and the Spaniard made it count, driving a sharply angled backhand crosscourt for a winner to lead 4-2, reaching 5-2 on a backhand return error from Khachanov off a second serve. Khachanov closed the gap to 5-3 but a scintillating running crosscourt passing shot winner off the forehand took Nadal to 6-3. One last return of serve error from Khachanov concluded the contest. Nadal was victorious 6-1, 6-4, 7-6 (3). The Spaniard's form declined somewhat during the last set. He needed some luck to avoid a fourth set. Across the last two sets, he failed to convert on ten of eleven break points. He had to dance his way out of some dangerous corners at 3-4 and 5-6 in the third set. But the fact remains that when the chips were down he came through. No doubt nerves set in during the latter stages of the encounter, but Nadal played through them with supreme discipline. Another set he did not need. And the two-time Wimbledon champion made certain that he would avoid a longer confrontation. And so he has that fourth round appointment with Muller on Monday. He should win in three or perhaps four sets because he is so much better from the backcourt than his opponent. Should that be the case, Nadal would likely take on 2014 U.S. Open champion Marin Cilic, and that could be a bruising skirmish against one of the game's greatest servers. I believe, though, that Nadal will be stronger mentally when it counts and will make enough aggressive second serve returns to get the job done. That would take Nadal into the semifinals, and by then no one would relish the notion of playing him on the Centre Court. There is a long way to go in this tennis tournament, but Rafael Nadal is right where he wants to be at the moment, poised for a sterling second week, ready to make the most of his chances, and eager to remind everyone that he has what it takes to rule once more on the grass courts of Great Britain.